Wade James is a Registered Chinese Medicine Practitioner, Acupuncturist, Chinese Herbalist and Chinese Herbal Medicine Dispenser with over 30 years experience. Wade has a Masters Degree in Traditional Chinese Medicine from the University of Technology Sydney. He has worked in hospitals in China in both acupuncture and Chinese Herbal clinics over many years. Over the last 10 years he has completed post graduate training in Classical Chinese medicine. This is the medicine of the Han Dynasty that was lost for 1800 years, but with documents having been found in the Dun Huang caves and published more recently, we now have access to the unique insights of this complete system of functional medicine. He is a member and Fellow of The Australian Acupuncture and Chinese Medicine Association (AACMA). He is Registered with AHPRA as an Acupuncturist, Chinese Herbal Medicine practitioner and Chinese Herbal Dispenser. Over the last decade Wade has focused on the roots of Chinese medicine completing post graduate training in Classical Chinese medicine. This has enabled him to apply the insights from this system of medicine to patients today. Wade has an ongoing commitment to the development of the TCM profession in WA, Nationally and internationally. He co-ordinated the delivery of the first professional four year program in Traditional Chinese Medicine in Perth that has over 50 graduates. 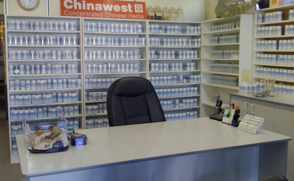 As a Director of Chinawest Pty Ltd they distribute the highest quality Chinese herbs nationally to TCM practitioners. He is a Director of The Shanghai International TCM Seminars, a new and innovative event held in Shanghai. Through extensive travel in China he has established training links to several leading TCM hospitals for Australian and International TCM students and practitioners. And he has presented academic papers at National and International TCM conferences. Wade has previously written a regular column for the Mind and Body section in The West Australian Newspaper over a number of years. Unfortunately these articles can no longer be viewed on this website as strict new rules on advertising apply by AHPRA.